Vanna Gene (Klitzke) Wolff, 74, of Glencoe, died Thursday, April 13, 2017, at her home. Honorary casket bearer was Hendric Wolf. Casket bearers were her grandchildren, Hanna Miller, Nicholas Schiroo, Miranda Michaletz, Elijah Michaletz, Mitchell Wolff, Zachary Ross, Courtney Wolff, Ethan Wolff and Brittney Wolff. Vanna Gene (Klitzke) Wolff was born Jan. 29, 1943, in Seattle, Washington, to Harold and Martha (Frauendienst) Klitzke. She was baptized as an infant on Feb. 28, 1943, by the Rev. Hugo Gurney, at her parents’ home in Seattle, and was confirmed in her faith as a youth June 9, 1957, by the Rev. Hugo Schwartz, at Grace American Lutheran Church in Brownton. She received her education in Brownton, graduating from Brownton High School. On June 2, 1962, she was united in marriage to Donald Wolff by the Rev. Roesler at Immanuel Lutheran Church in New Auburn. The couple made their home in Glencoe, and their life was blessed with four children, Pam, Tim, David and Dawn. They shared over 55 years of marriage. In addition to being a loving wife, mother and homemaker, Mrs. Wolff worked at Glencoe Regional Health Services as a dietary aide and certified nursing assistant for 30 years. 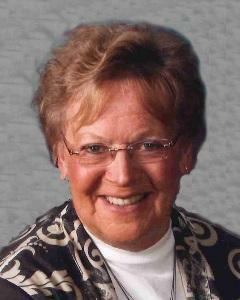 She was a member of First Evangelical Lutheran Church in Glencoe, where she attended Bible study. She also volunteered with Common Cup Ministry. Mrs. Wolff enjoyed gardening, scrapbooking, crafts and square dancing. She loved her dogs, Chloe and Muffin. She cherished the time spent with her family and friends. She is survived by her husband, Donald Wolff of Glencoe; children, Pam (Larry) Schiroo of Gaylord, Tim (Jennifer) Wolff of Lonsdale, David (Dawn) Wolff of Glencoe and Dawn (Joel) Michaletz of Litchfield; nine grandchildren, Hanna Miller (special friend Tim Thomas), Nicholas Schiroo, Zachary (Cathryn) Ross, Mitchell (Nichole) Wolff, Courtney Wolff (special friend Cole Polzin), Ethan Wolff, Brittney Wolff, Miranda Michaletz (special friend Nicholas Hirsch) and Elijah Michaletz; five great-grandchildren, Jocelynn Miller, Isaac Miller, Paityn Wolff, Broghan Wolff and Nash Wolff; sister, Roxanne (Doug) Borkhoff of Wells; nieces, nephews, other relatives and many friends. She was preceded in death by her parents, Harold and Martha Klitzke; grandparents; and brother-in-law, Stewart Behr.